Plain, simple and absolutely gorgeous. A simple ivory pearl on a Sterling Silver slimline band. 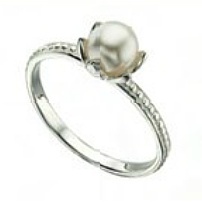 To complete the design the silver frames the pearl offering protection - in the same way your beloved looks after you! 925 Sterling Silver.